← Real Women Have Curves! As I enjoyed the 70 + degree weather today, my mind goes immediately to our holiday last October, when we also experienced unseasonable 70 degree weather. Our Indian Summer, or Autumn holiday we experienced Up North, which is a special term generally referring to a place in Michigan in the Northwest part of the state. My husband had the idea of a Fall color tour; I researched southern Indiana, Virginia’s Blue Ridge Mountains, and some other places. But then we both decided over Sunday breakfast one day that the State of Michigan’s economy could use our tourist dollars, and was also less driving time with kids. So Up North was chosen. I was born and raised in Michigan, but I never spent much time in the Northwest area of the state. And may I say WOW! It is beautiful! Good Morning America’s viewers recently voted Sleeping Bear Dunes National Lakeshore the most beautiful place in America (read story here) and now I see why. 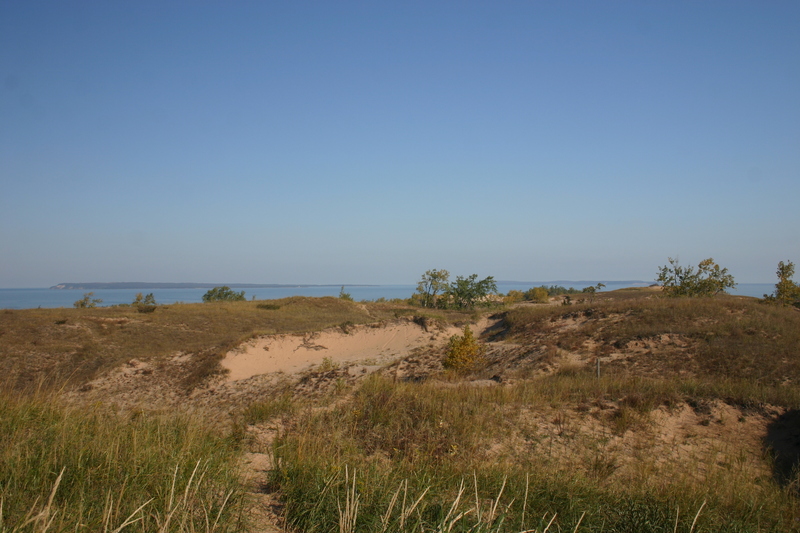 You can stand on a sand dune and peek over to Lake Michigan on one side, with the Manitou Islands in view, while still seeing Little Glen and Big Glen Lakes on the other. The trees were beginning to turn. It was absolutely magnificent! We could have easily spent days there, as the entire national park encompasses an area over 30 miles. So now for a refresher geology course, courtesy of the National Lakeshore. Glaciers carried a lot of sand and sediment, and when they melted, large hills were left. 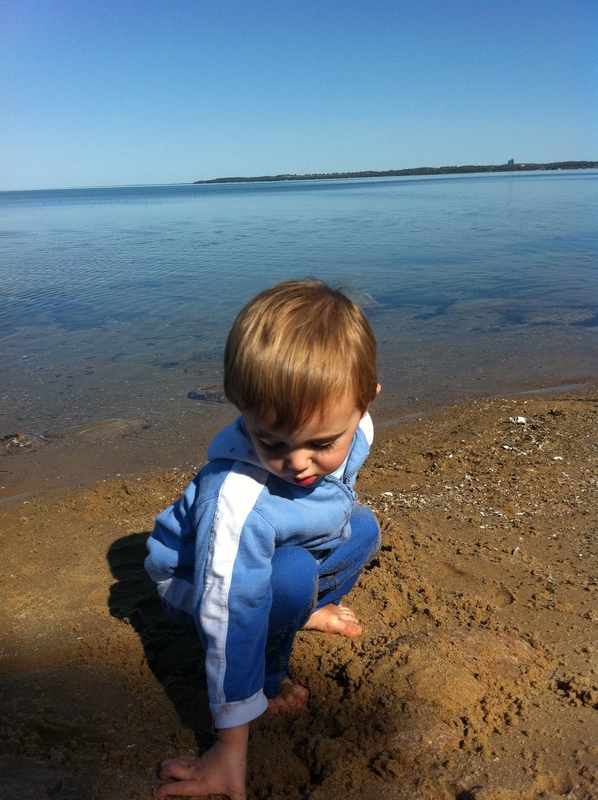 Combined with the wind off the lake, a sand dune is formed. Imagine how big those glaciers once were to leave such a large sand dune! In Michigan, we are surrounded by sand dunes. And Glen Lake actually used to be connected to Lake Michigan as glacial erosion carved out both lakes during the ice age. Then a sand bar developed, which is actually where the present day village of Glen Arbor sits – where we lodged during our journey. The two islands, now named North and South Manitou Islands, can be visited via ferry boat, daily in the summer season and less frequent in the off season. From what I understand, they are remote camping islands, and for this family, will be visited in the future when we can do it as a day trip. In true family fashion, we set out to climb the dune, not really understanding what was in front of us. 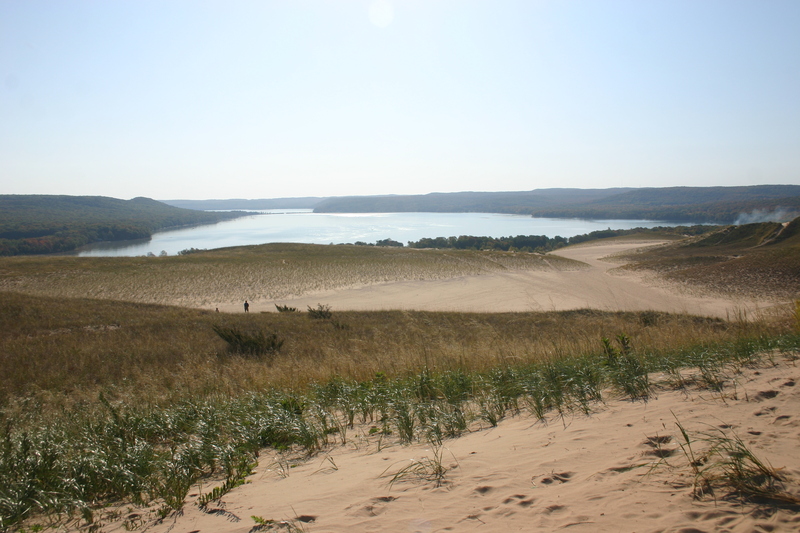 Sure we could see the top of one dune, but little did we know there were actually about four more ridges to climb over after that one in order to see Lake Michigan! About half way up the first dune, we realize our two year old has a dirty diaper. But thinking that were almost there, we trudge ahead. By about the third ridge, a crying two year old, whining four year old (are we there yet? ), and drill sergeant husband all combine to one heck of a tiring morning! But the beauty was magnificent. After finding lunch at a local tavern, we head south toward the visitors center in Empire, Michigan. Our children have just fallen asleep, so we seek out another scenic drive and head over to Bar Lake – it looks interesting on the map. We pass a public beach, but much smaller and rural than ours at home, and then notice some beautiful homes in the distance. Imagine owning a house here, literally sandwiched between Lake Michigan and Bar Lake on this sliver of land, probably no larger than 50 yards. Needless to say I bet they don’t have basements! The drive eventually turned into a private road so we turn around. 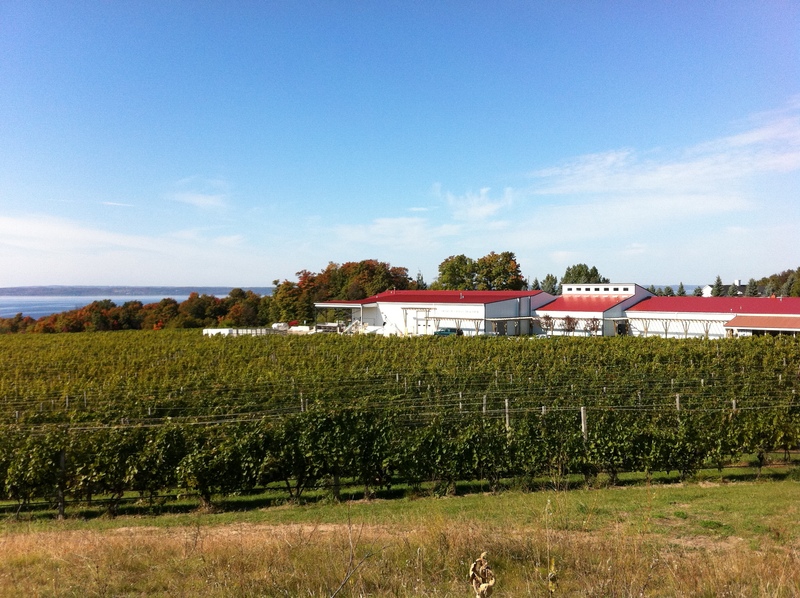 We were lucky to have a few hours without the children to tour the wine country on Old Mission Peninsula. And we also got an impromptu refresher on remembering how to read a map when the GPS fails. This small sliver of a peninsula in Grand Traverse Bay offers about 7 or so wineries and the drive was absolutely beautiful. At the tip, there was a lighthouse we could tour. And it was not only for wine lovers; my husband also found one of his faves – the Jolly Pumpkin Brewery – and we had a nice lunch there too. 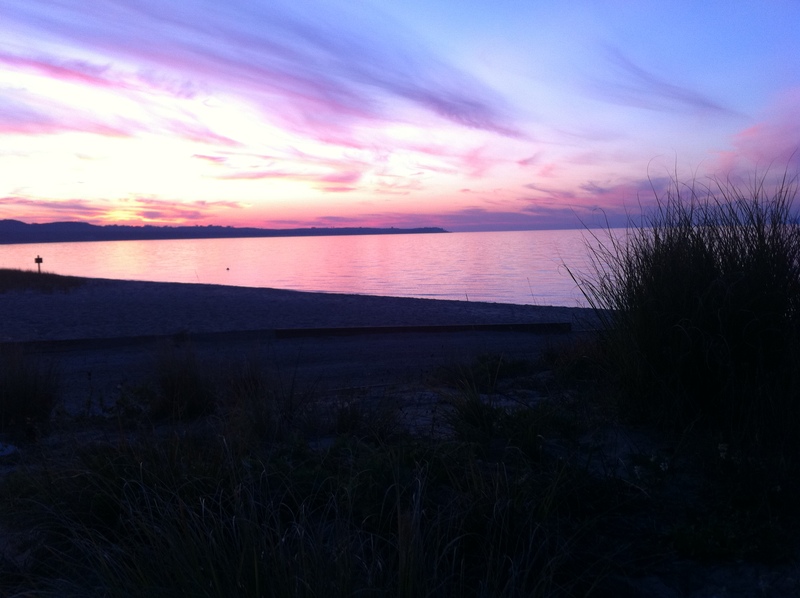 We ventured to Leelanau Peninsula on our next driving day. While larger than Old Mission Peninsula, it was a big farther from our hotel so we really just took it as a driving tour of another magnificent scenic drive, complete with wineries and a lighthouse museum again at the tip. Oh, and a snake family I almost stepped on at the lighthouse! I am not a serpent lover, so I quickly hopped over them. They were either very young (imagine large worm-sized) or some type of very small species. Yuck!